There are few women accessories that can so explicitly express beauty and class such as a pearl jewelry set does. Although Marilyn told us that a diamond is a girl’s best friend, when it comes to a bride’s outfit, pearls are the ultimate component, the element that will turn your day into a happy memory. The name alone can evoke the beauty and magic of these jewels that are born in the heart of the sea. No wonder these gems are the foundation of women’s jewelry casket, they are feminine and fresh, always capable of enhancing a woman’s beauty and style. The best part about pearl jewelry sets is that you can wear them with almost every costume in your wardrobe, as the possibilities and settings are endless. This is why most brides choose to wear pearl sets on the most important day of their lives. It is very simple: if you are getting married and you are planning your wedding all day long, the jewelry set that you are going to wear is one of the most important aspects to take care of, along with the dress, the bouquet and the hairstyle. What could be more distinguished than a pearl jewelry set, with a fashionable necklace and lovely earrings that will make you look like a queen? Although it may not be easy to choose the perfect one for your wedding day, it is worth the effort. This is one of the classiest pearl bridal jewelry sets, consisting of a simple, yet effective necklace and one pair of beautiful earrings. On the necklace, each freshwater cultured pearl is hand strung on a fine double knotted silk thread, being separated from its neighbors by a hand tied double knot, so that they cannot rub or damage the luster or the shape of one another. The (AAA) near perfect shape of the pearls will give you a breathtaking appearance, it will be impossible for anyone to miss your presence, as freshwater pearl jewelry sets never fail to impress. If nature endowed you with fair skin tone, then you should probably consider wearing pink pearl jewelry sets as often as you can, not only at your wedding. This set includes a double strand necklace and bracelet, while the pearl earrings are in a single button shape. The petite size (6-7mm) makes your set a striking piece, without being overbearing, and the whole set will last for generations to come, so maybe you will pass them on as a gift, when it will be your turn to be a mother. You believe Black is the new Black, but you still want the traditional white dress? Then choose a black pearl jewelry set and you will make the best of both worlds. The necklace and the bracelet are secured with a dashing clasp and they are both hand strung on a fine double knotted silk thread. The size being larger than the average pearl – 7-8 mm – this piece is more valuable and unique. Whenever you have to pick the jewelry set that you are going to wear, take into consideration four factors that are the most important in designating the value and quality of the pearl: the lustre (refers to its brilliance and inner glow), the surface (refers to the kind of flaws that appear on the outside of the jewel), the shape (there are 8 categories, try to pick the roundest one) and the color (varying from white to black and all the colors in between). If you want still want to follow Marilyn’s piece of advice, but you do not want to give up on pearls just yet, go for this gorgeous jewelry set that will make even a flower green with envy. Combining diamonds, white gold and pearls, this matching set will steal everyone’s hearts at your reception, making you look like a genuine princess. Displaying a three diamond style, this will charm your groom anew and you might just find yourself blushing like a girl, due to the gazes cast on you. These 8-9 mm Japanese Akoya pearls (Kokichi Mikimoto would be proud of this set) have (AAA) near perfect shapes and luster. Designed with 14k white gold, these pieces offer a beautiful display of colorful rays, due to the diamonds encased in the charms. This is a different type of combination, in which 6-7 mm sized white pearls are paired with 14k yellow gold. The beauty of this set is that the flexible necklace gives a certain sense of freedom to the pearls, which lay along your neckline, matching the natural contour of your body. The delicate gleam of your dangling earrings will turn heads, giving you a natural and stylish look. The creative set consists of Japanese Akoya pearls, so the high quality is guaranteed. 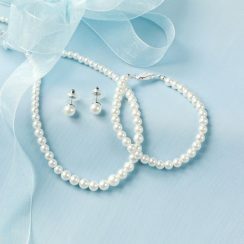 You can also ask your friends to wear pearl bridesmaid jewelry sets, matching their dress color. Do not settle for one of those faux pearl jewelry sets, you always deserve the best, not only on your wedding day. Fake cheap pearls might just blur your happy memories, so try and be creative, carefully inspect all the options and choose what suits you best. If you like combining elements, you can choose a rhinestone and pearl jewelry set or one with blue crystal and pearls, so that you will have that “something blue” well-adjusted to your outfit. South sea pearls will give you a vintage look if you decide to go for that, which also applies to the ivory pearls. But no matter what you choose, at the end of the day, you will always be able to recall your happiest memory just by touching the smooth surface of your pearl necklace.